Eligibility. 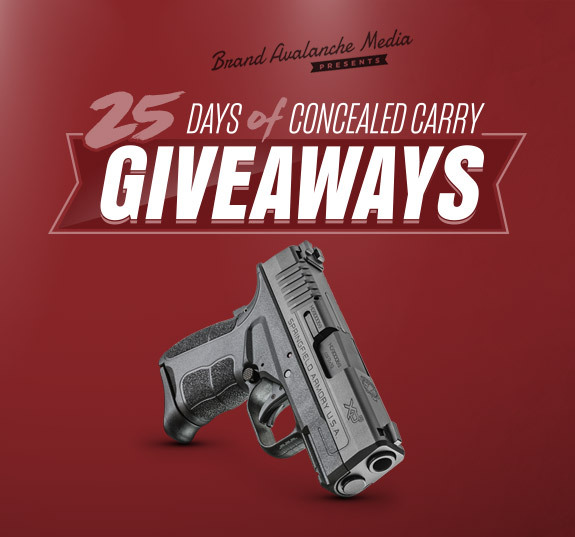 This Brand Avalanche Media Giveaway known as "25 Days of Concealed Carry Giveaways” (or the “Promotion”) is open to all individuals over the age of 21 and who are legal residents of the United States at the time of entry, except as follows: Residents of New York, Florida, California and Rhode Island are ineligible to participate or win. Except also: Employees of Brand Avalanche Media, LLC d/b/a Brand Avalanche (“Sponsor”) and its subsidiaries, affiliates, partners, distributors and advertising or promotion agencies and the immediate families of such persons (spouse, parents, siblings and children and each of their spouses) and persons living in the households of each of these individuals whether related or not are ineligible to participate or win. The term “affiliate” includes companies donating prizes to Sponsor for this Promotion. All eligibility is subject to applicable federal, state, and local laws and regulations. Entry: To enter, simply sign up for each of the following Sponsor’s and/or affiliates’ newsletter during any Promotion Day (defined below) posted for that Promotion Day. On or before the start of each Promotion Day, we will list the affiliates and any additional entry methods on the Gleam website listed above for that Promotion Day. For each Promotion Day on which you want to enter the drawing, simply sign up for one or more newsletters or do any one or more of the optional entry actions. Each newsletter sign up or other action you take as permitted is a separate entry for that Promotion Day. Enter the Promotion as many days as you want, but each entry is good only for the Promotion Day performed. Submit as many entries for each Promotion Day as you want as permitted by these rules. You must follow or complete all required steps. Enter only on a Facebook, Instagram, Twitter or email account you own. Comments left on Facebook, Instagram, or Twitter, via email or other sources, are not acceptable entries. Anyone found to use multiple accounts on Facebook, Instagram or Twitter will be disqualified. Multiple posts on Instagram or retweets on Twitter in a single day will not be accepted as additional entries. Each Promotion Day’s entries must be received by 11:59 p.m on that Promotion Day. Odds. Odds of winning each Promotion Day’s prize depend on the number of entries for that Promotion Day. Limit: Each entrant must have his or her own personal email address, or Facebook, Instagram or Twitter account and may use only one of each such account to enter. Entrants may not share the same email address. Using multiple/different email addresses, identities, registrations, logins, or any other method to attempt to enter the Promotion more than the allowed number of times will void all of an entrant's entries, and that entrant may be disqualified from participation in the entire Promotion. Use of any automated system to enter the Promotion is prohibited and will result in disqualification. Sponsor and its affiliates are not responsible for lost, late, incomplete, invalid, unintelligible or misdirected registrations, which will be disqualified. If there is a dispute as to any registration, the authorized account holder of the email address used to register will be deemed to be the registrant. The "authorized account holder" is the natural person assigned an email address by an Internet access provider, online service provider or other organization responsible for assigning email addresses for the domain associated with the submitted address, or the person who is assigned to a Facebook, Instagram or Twitter account by Facebook, Instagram or Twitter and associated with the entry. Each entrant may be required to show proof of being the authorized account holder. Winners: One (1) winner (the “Winner”) for each Promotion Day will be selected to receive the prize or prizes for that Promotion Day. The prizes or prizes for each Promotion day will also be listed on the Gleam website and our website. One Winner for each Promotion Day will be randomly selected by Sponsor immediately following the close of that Promotion Day (between midnight and 1 a.m the day following the Promotion Day). The Winner for each Promotion Day will be announced the following morning at approximately 9:00 a.m. central time and will be notified by email at the email address or other account address provided with the Winner’s entry or entries in the Promotion. If the Winner cannot be reached within fourteen (14) days from the first notification attempt, then that Winner shall be disqualified and an alternative Winner for that Promotion Day will be randomly selected from that Promotion Day’s entries. Winners of prizes valued at $600 or more will be issued an IRS 1099 Form for the value of the prize. The Winner will be required to sign and return an Affidavit of Eligibility, Liability Release, where lawful, Publicity Release, where lawful, including Social Security Number or Taxpayer Identification Number for tax reporting, and other authorizations required by Sponsor or applicable law or the prize may be forfeited. All prizes are awarded "AS IS," "AS AVAILABLE," and without warranty of any kind, express or implied, including without limitation any implied warranty of merchantability or fitness for a particular purpose. All federal, state and local taxes and duties are the Winner’s responsibility. A prize may not be assigned, transferred, substituted or redeemed for cash, except that Sponsor or an affiliate that provided a prize may substitute a prize of equal or greater value in the event the listed prize is not available or cannot be awarded. The Winner will be required to provide his/her personal details and mailing address before the prize can be released. The prizes will be delivered by regular U.S. mail or private courier. Unclaimed prizes will not be awarded. Firearm Giveaways: Notwithstanding the other rules set forth herein, prior to transfer of any prize subject to any state or federal firearm laws, each Promotion Day Winner who wins a firearm will be required to identify and provide supporting information from a licensed federal firearms dealer who is eligible to receive and transfer said prize to that Winner pursuant to all applicable federal, state, and local laws. The Winner is responsible for all firearm dealer transaction fees, background check fees and firearm transfer requirements imposed by federal, state, and local laws. Taxes on prizes and all expenses related to acceptance and use of any prize and not specified are the sole responsibility of the Winner. Failure to provide all required signatures and documents will disqualify the Winner from further participation in the Promotion (for any Promotion Day) and any award(s) of prizes. In the event a new law or regulation goes into effect that will make any listed firearm illegal, Sponsor will withdraw the prohibited firearm from the list of prizes for the affected Promotion Day or Promotion Days but not otherwise affect or change the Promotion Day. Any Winner of a firearm must be able to pass background checks and comply with all required Federal, State and Local laws in order to take possession of the prize. No person other than the Winner may take possession of the prize. Failure to comply with all Federal, State and Local laws including but not limited to background checks for possession will result in the forfeiture of the prize and another winner will be selected. Due to regulations in different states, cities and other areas, firearms prize winners may be provided non-firearm prizes of similar value. Decisions: By entering into the Promotion and for each Promotion Day in which entered, entrants agree to abide by and be bound by these official rules, and to accept the decisions of Sponsor or an applicable affiliate as final. Entry in this Promotion on each separate Promotion Day does not constitute entry into any other promotion, contest or sweepstakes of Sponsor or any affiliate, including any other Promotion Day. Neither Sponsor nor any affiliate is responsible for stolen, lost, late, misdirected, damaged, incomplete, or illegible entries, whether due to system errors or failures, faulty transmission or other telecommunications malfunctions, entries not received resulting from any hardware or software failures of any kind, lost or unavailable network connections, failed, incomplete or garbled computer or telephone transmissions, typographical or system errors and failures, technical malfunctions, spam filters, or otherwise. Sponsor may prohibit an entrant from participating in the Promotion on any one or more Promotion Day or winning a prize if, in its sole discretion, it determines that said entrant is attempting to undermine the legitimate operation of the Promotion by cheating, hacking, deception, or other unfair playing practices (including the use of automated quick entry programs or any other entries generated by a script, macro, or other automated means) or intending to annoy, abuse, threaten or harass any other entrants or Sponsor. Social media content that, in Sponsor’s opinion, is inappropriate, incomplete, garbled, corrupted, or unintelligible for any reason, including, but not limited to, computer or network malfunction or congestion, is void and will not be accepted. In case of a dispute over the identity of a participant, the authorized account holder of the Facebook, Instagram or Twitter account used to enter will be deemed to be the participant. By participating in this Promotion, you understand and agree that information you provide in your entry(ies) or on Facebook, Instagram or Twitter in connection with this Promotion on each Promotion Day that you enter the Promotion will be used by Sponsor and its affiliates in accordance with the official rules of this Promotion, as well as Sponsor’s or the applicable affiliate’s Privacy Policies. If for any reason this Promotion is not able to be conducted as planned, or any Promotion Day or Promotion Days are not able to be conducted as planned,, including, but not limited to, by reason of infection by computer virus, bugs, tampering, unauthorized intervention, fraud or any other causes beyond the reasonable control of Sponsor which corrupts or affects the administration, security, fairness, integrity or proper conduct of the Promotion or any Promotion Day of the Promotion, then Sponsor reserves the right at its sole discretion to cancel, terminate, modify or suspend the Promotion or any affected Promotion Day or Promotion Days and randomly draw from those entries received up to the cancellation/suspension date. If this is done, drawings for separate Promotion Day prizes will be made separately from a pool of entrants. Sponsor reserves the right to disqualify any participant or Winner, and may refuse to award any prize to a person, who fails to follow these official rules or who is ineligible or has violated any rule, gained unfair advantage in participating in the Promotion, obtained winner status using fraudulent means or made any misrepresentations relative to the Promotion, and Promotion Day and prize redemption. CAUTION: ANY ATTEMPT BY AN ENTRANT TO DELIBERATELY DAMAGE OR UNDERMINE THE LEGITIMATE OPERATION OF THE PROMOTION OR ANY PROMOTION DAY(S) MAY BE IN VIOLATION OF CRIMINAL AND CIVIL LAWS AND, SHOULD SUCH AN ATTEMPT BE MADE, SPONSOR RESERVES THE RIGHT TO SEEK REMEDIES AND DAMAGES (INCLUDING ATTORNEYS’ FEES) FROM ANY SUCH ENTRANT TO THE FULLEST EXTENT OF THE LAW, INCLUDING SEEKING CRIMINAL PROSECUTION. By participating, entrants acknowledge and represent that they unconditionally agree to be bound by these Official Rules and the decisions of Sponsor, which are binding and final in all matters relating to this Promotion and waive any right to claim ambiguity in the Promotion or these Official Rules. Facebook Entry Terms: Each entrant who enters the Promotion using Facebook must be a member of good standing of Facebook, with an active account, in order to participate in the Promotion. Facebook is not a sponsor of this Promotion and does not endorse or otherwise have anything to do with this Promotion. By entering this Promotion, entrants expressly and completely release Facebook from any liability whatsoever relative to the Promotion. In the case of a dispute over a Facebook entry, the authorized account holder of the Facebook account used to enter will be deemed to be the entrant. “Authorized account holder” is defined as the person who is assigned a Facebook account by Facebook. Publicity: Each Winner agrees to permit Sponsor to use his/her name and likeness in promotional and other Sponsor materials, without additional prizes, compensation or permission, except where prohibited by law. Each Winner also agrees that their name and prize value will be given to other people upon request. YOU ACKNOWLEDGE AND AGREE THAT ANY ACCEPTANCE, PARTICIPATION IN OR WITH, AND/OR USE OF ANY PRIZE ARE SOLELY AT YOUR OWN RISK. YOU, ON BEHALF OF YOURSELF AND YOUR ASSIGNS, HEIRS, DEVISEES AND ESTATE (COLLECTIVELY, "SUCCESSORS"), HEREBY UNCONDITIONALLY AND FOREVER RELEASE, DISCHARGE, AND AGREE TO INDEMNIFY, DEFEND, AND HOLD HARMLESS SPONSOR, ITS AFFILIATES AND OTHER PROVIDERS OF ANY PRIZE AND EACH OF THEIR RESPECTIVE PARENT COMPANIES, SUBSIDIARIES, AFFILIATES, OFFICERS, DIRECTORS, EMPLOYEES, AGENTS, PROFESSIONAL ADVISORS, AND CONTRACTORS (COLLECTIVELY, "RELEASED PARTIES"), FROM ANY AND ALL CLAIMS, JUDGMENTS, COSTS, DAMAGES, LOSSES, EXPENSES, AND LIABILITIES (WHETHER UNDER CONTRACT, WARRANTY, TORT (INCLUDING NEGLIGENCE, WHETHER ACTIVE, PASSIVE, OR IMPUTED), STRICT LIABILITY, PRODUCT LIABILITY, OR ANY OTHER THEORY) RELATING TO ANY CLAIM YOU MAY NOW OR LATER HAVE WITH RESPECT TO ANY DEATH, PERSONAL INJURY, PROPERTY DAMAGE, PECUNIARY, OR OTHER LOSS, DAMAGE, COST, OR EXPENSE (COLLECTIVELY, "HARM") THAT MAY BE SUFFERED BY YOU OR ANY THIRD PARTY AS A RESULT OF THE PROMOTION, ANY USE BY THE RELEASED PARTIES OF YOUR NAME, LIKENESS (INCLUDING, WITHOUT LIMITATION, AURAL AND VISUAL LIKENESSES OF YOU), OR BIOGRAPHICAL DATA, OR IN CONNECTION WITH YOUR ACCEPTANCE, PARTICIPATION IN OR WITH, USE OF, AND/OR INABILITY TO USE ANY PRIZE AWARDED TO YOU, EVEN IF SUCH HARM IS CAUSED SOLELY BY THE RECKLESSNESS, NEGLIGENCE, OR FAULT OF ONE OR MORE RELEASED PARTIES (COLLECTIVELY, THE "RELEASED CLAIMS"). YOU UNDERSTAND AND AGREE THAT THIS RELEASE WILL PREVENT YOU AND YOUR SUCCESSORS FROM BRINGING ANY ACTION AGAINST ANY RELEASED PARTY AND FROM RECOVERING ANY MONEY DAMAGES OR OTHER RELIEF FROM ANY RELEASED PARTY IN CONNECTION WITH ANY OF THE RELEASED CLAIMS. All issues and questions concerning the construction, validity, interpretation, and enforceability of these official rules, or the rights and obligations of the entrant and Sponsor in connection with the Promotion shall be governed by, and construed in accordance with, the substantive laws of the State of Illinois, without regard to its choice of law provisions. You irrevocably consent to the exclusive jurisdiction and venue of the federal and state courts located in Rock Island County, Illinois, with respect to any claim or suit arising out of or in connection with these Official rules, the Promotion, any delivery, mis-delivery, or non-delivery of any prize or your acceptance, participation in, use of, or inability to use any prize, and agree not to commence or prosecute any such claim or suit other than in the aforementioned courts. EACH OF THE PARTIES HEREBY IRREVOCABLY WAIVES ANY AND ALL RIGHT TO TRIAL BY JURY IN ANY LEGAL PROCEEDING ARISING OUT OF OR RELATING TO THESE OFFICIAL RULES, THE PROMOTION OR ANY OF THE RELEASED CLAIMS. You understand and agree that your consent to these official rules set forth above is a material inducement for Sponsor and its affiliates to award a prize to you and that Sponsor and its affiliates would not do so in the absence of your consent as evidenced by your participation in the Promotion for each Promotion Day you enter the Promotion. Except where prohibited by law, as a condition of participating in the Promotion, each entrant agrees that (1) any and all disputes and causes of action arising out of or connected with each Promotion Day’s drawing or any prizes awarded, shall be resolved individually, without resort to any form of class action, and exclusively by final and binding arbitration under the rules of the American Arbitration Association and held in Chicago, Illinois; (2) the laws of the State of Illinois will govern the enforcement and all proceedings at such arbitration; and (3) judgment upon such arbitration award may be entered in any court having jurisdiction. Under no circumstances will any participant be permitted to obtain awards for, and each participant hereby waives all rights to claim, punitive, incidental or consequential damages, or any other damages, including attorneys' fees, other than actual out-of-pocket expenses (i.e., costs associated with entering the Promotion), and waives all rights to have damages multiplied or increased under any federal or state law. This Promotion is void where prohibited by law or regulation. Sponsor may substitute prizes of equivalent value, amend the rules or discontinue the Promotion at any time. Sponsor disclaims any responsibility to notify participants of any aspect related to the conduct of this Promotion. The name of each Winner and written copies of these rules are available by mail upon written request to Sponsor, 4343 16th St #161Moline IL 61265, with a stamped, self-addressed return envelope. All requests must be received by September 15th, 2018. · This Promotion is promoted and sponsored by Brand Avalanche Media, 4343 16th St #161 Moline IL 61265 61265 This Promotion is in no way sponsored, endorsed or administered by, or associated with Facebook, Twitter, Instagram, or Gleam.